Sadly the reality of living with sensitive skin and allergies is that not everything goes according to plan when I choose new skincare. You’ll notice this latest *Love Lula review is light on products and that’s because not every item I picked ended up working for me. I’m going to focus on the positive and I may revisit the other products at a later date after further research. Admittedly the Lovea Ideal Hydration Organic Coconut Fabric Face Mask was something I threw into my selection last minute without much consideration aside from checking ingredients. It turned out to be an unexpected winner. Whilst I’m familiar with the name Lovea, I hadn’t sampled any of their products. Lovea is an independent company, founded in 1992 in south west France. Their range includes suncare (inspired by the beauty secrets of Polynesia) and beauty products for face, body and hair. Products are suitable for Vegans and COSMOS organic certified by ECOCERT. Sheet masks seem very much on trend at the moment and I can see the appeal. However when choosing this type of mask I think it’s important to consider your environmental impact, many are made of synthetic fibres similar to wet wipes so they don’t decompose easily. Lovea are using 100% organic cotton which you may be able to compost but I’m unsure about the other ingredients it is soaked in. You do need to bin not flush these products and I’d make sheet masking an occasional treat rather than regular treatment. Putting this aside I thoroughly enjoyed the experience of Lovea Ideal Hydration Organic Coconut Water Sheet Mask. The active ingredients are aloe vera and coconut pulp water which I found to be soothing giving a fresh feeling and cooling sensation. Once I removed the mask my skin felt refreshed and glowing, even my husband commented on this. Any excess serum left on your face can be wiped away or massage into your skin; I opted for the latter because I love the extra hydration for my dry skin. 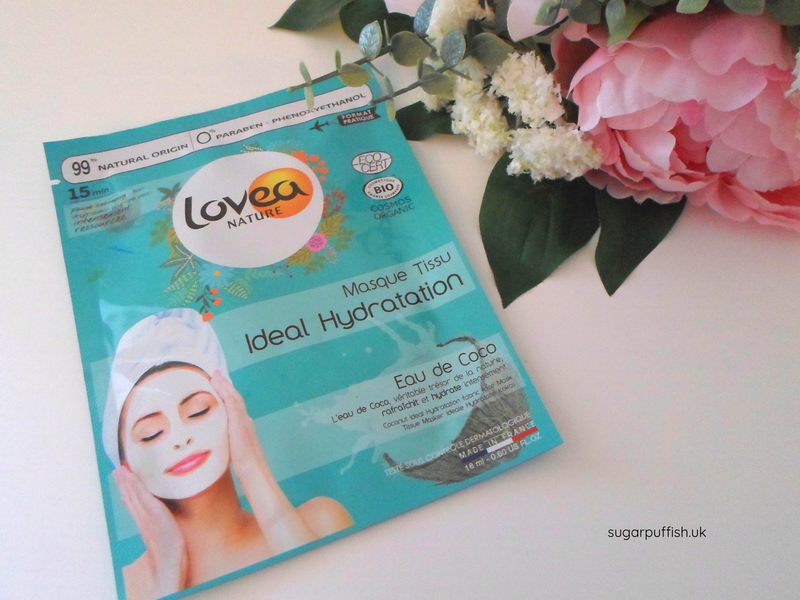 My final thoughts are the Lovea Ideal Hydration Organic Coconut Water Sheet Mask is a fun, affordable product which performed better than expected. I’m pleased I took the plunge to try because now I’m keen to explore more from Lovea's range.